No, this isn't a pumpkin spice latte. I know fall is right around the corner and we're ALL ready for hayrides and riding boots but at the end of each season, I feel this sudden rush to savor a few last things. For instance, right now I need to have gazpacho one last time. I need to wear flip flops 24/7. I need a bright pedicure. (True story.) 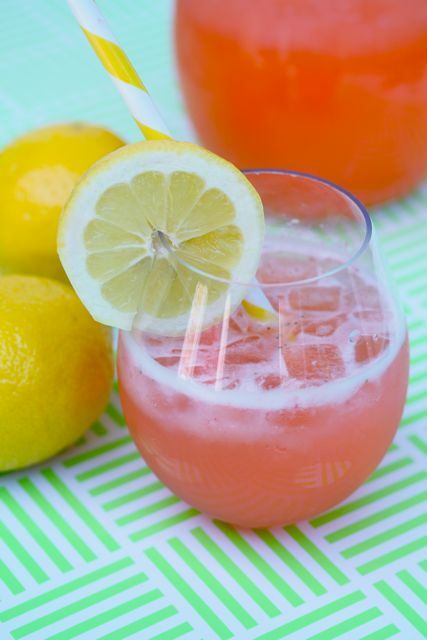 This strawberry lemonade is part of that insanity. Please forgive me. I'm pretty sure once you mix this up, you'll wish summer would stick around a little longer too. 1. Puree strawberries in a blender or food processor. Then strain strawberry puree through a fine mesh strainer. (This will remove any large seeds.) Set aside. 2. Make lemonade according to package directions. Then add strawberry puree. Stir and chill for 30 minutes. Serve over ice and enjoy.